A London mosque allegedly used as the “headquarters” of a sectarian hate group is under investigation by the Charities Commission for “distributing literature from its premises” promoting “hatred” towards the persecuted Ahmadi sect. 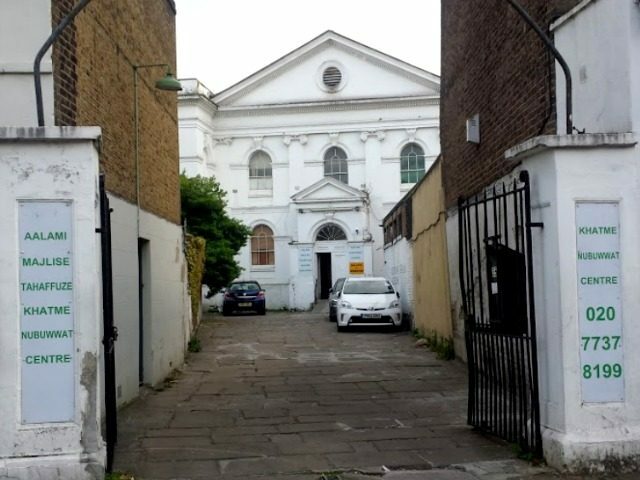 Stockwell Green Mosque, a registered charity, is also known as Khatme Nabuwat – an organisation with the stated aim of annihilating the Ahmadi Community, who they refer to with derogatory language as the “Qadiyani cult”. The group’s activities have been well known for years, but the government department was only prompted to act after the BBC published leaflets found at the mosque this April suggesting Ahmadis who did not convert to mainstream Islam within three days should face “capital punishment”. The mosque denied the leaflets were on their premises. Earlier in April, a Breitbart London investigation also uncovered Khatme Nabuwat literature calling on Muslims to “beware of Qadiyans” and claiming to “expose their seditious infidel beliefs” which are “very dangerous”. In turn, the press only began to take an interest in the plight of the Ahmadi people after the brutal murder of Asad Shah, an Ahmadi Muslim, in Glasgow this year by a Sunni Muslim who claimed Mr. Shah had “disrespected Islam”. Khatme Nabuwat was officially affiliated with the Muslim Council of Britain (MCB) – the UK’s “largest national representative of British Muslim associations, mosques, and schools” – until the press outrage began. Despite disaffiliating, the MCB continues to class Ahmadis as “apostates” and “infidels” (an accusation punishable by death in much of the Muslim world) and appointed an imam who has supported Khatme Nabuwat and believes apostates should be killed to investigate the hate group. A press release from the Charity Commission revealed a raft of other concerns had been discovered during visits to Stockwell Green Mosque in May and June. They had “identified serious regulatory concerns regarding how the charity is being managed including indications of poor governance, risks to charity property due to poor financial management, and the trustees carrying out activities outside of the charity’s stated objects”. Ahmadis are officially classed as non-Muslim in their native Pakistan, where they are routinely killed. Hatred of the sect is widespread among British Muslims and is on the rise. In the West, Ahmadis are known for taking a stand against extremism and terrorism and promoting pro-Western views. At the global Ahmadi conference this August, leaders called for all Muslim schoolchildren to swear a U.S.-style pledge of allegiance to the UK to encourage integration.